Andrew Cremer knocked down the turn marshall (Jake) on Thursday night 10/19/2006. 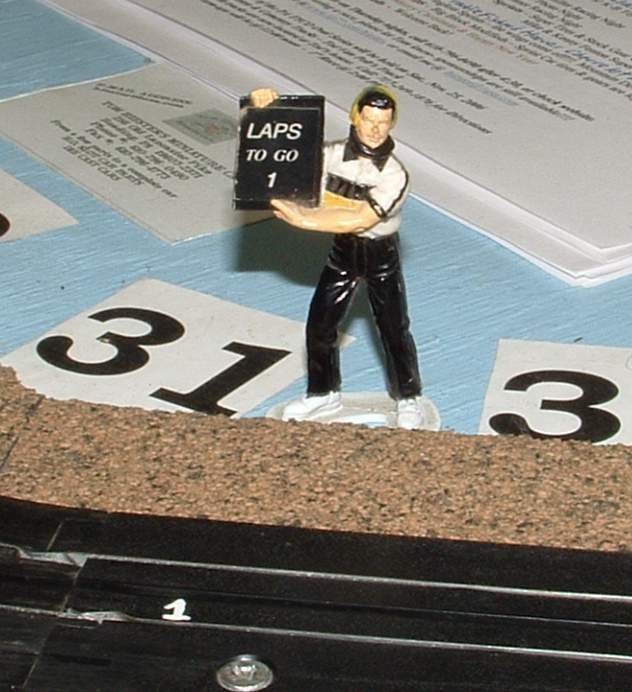 There are little plastic turn marshalls placed around the track at Tom Hiester's HO Raceway. If you knock down a man during competition racing you recieve a small amount of money built up in the kitty. Every Thursday night one dollar is put into the coffer and usually nobody knocks down a man and the pot builds. The money Andrew won Thursday night was a record wopping 32 dollars. Congratulations Andrew for setting a new record for the most money won by knocking the man down. Tom Hiester's HO Raceway has a few record breaking moments almost every race season. Last year (2006) racing season saw the youngest feature winner ever at Tom Hiester's HO Raceway. Lincoln Van Pelt won the 2006 BSRT night, this was the same night that the BCTV Television cameras were on hand filming our racing at the club. Lincoln Van Pelt was 11 years old at the time and won in the ever tough Modified division. One of the most unusual Track records at Tom Hiester's HO Raceway was the perfect night record. Six racers made history by running a perfect segment, no crashes. The perfect segment awards were distributed that night and still to this day have never been claimed again. This event is sponsored by Jim Lilac Construction.